Local media report that the authorities believe Mr Reyes co-ordinated an armed attack on a hospital in August in which seven people were shot dead. Police suspect the attackers were trying to free one of their leaders, who was jailed and in the hospital under armed guard. In 2014 Mr Reyes faced charges including murder and was detained in a maximum security prison. Prosecutors reportedly believed him to be connected to the deaths of at least 287 people. 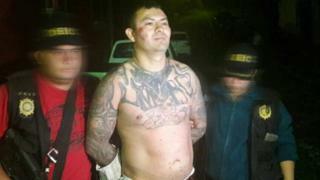 But he escaped, reportedly with the help of a group of people on motorbikes, while attending a medical appointment.